I found this bench in a park in the Providencia district. Its design is quite odd and looks very comfortable. It would be fun to have a self-molded armchair in your living room! ce banc est tres original, j'aime beaucoup. il fait le tour de la place ? 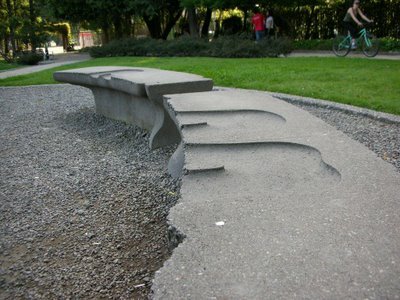 this bench is very original, I like much. it makes it tower of the place? Actually they are just for two people each and there are a couple more in the park. So, did you try it? Did your bottom fit the bench?